In this review of the Shoei Qwest Helmet we look at the decreased noise levels, along with being of a light weight and good comfort, plus most important of all protection. The helmet features a shapely oval geometric on the inside. When writing up the shoei qwest helmet review it was observed that it has a smaller helmet shell, this allows the advantage of being of light weight, which is always a blessing when wearing. However, the critical factor of this helmet is it seriously offers quality protection and safety inside and out. Thanks to the full face model design it provides uniqueness that it provides a greatly reduced levels of decibel in sound that come from a variety of sources. However, it still allows noises on the road to be heard which is needed for safe observation when traveling on the road. One of the challenges I feel that is important to address is that reducing noise down to nothing is dangerous as you still need to hear a suitable level of noises on the road. However, too much decibel of great intensity is detrimental to your audio health. See my blog post on how to chose a motorcycle helmet with safety in mind. The vent features on the motorcycle helmet shell are made to lower noise but still provide an airflow allowing you to feel nicely content while riding your bike. One of the compelling observations is the position of the vents. It includes a large vent at the lower chin area and an upper vent at the rear, this means that the air movement in the helmet is optimal. In observing the shoei qwest motorcycle helmet review, it is noticed that it uses a technology, the CW-1 visor with the Q.R.S.A. This stands for Quick Release Self Adjusting. This will guarantee a firm sealing at the face shield. This is achieved by moving the shield back so it makes contact with the opening seal evenly. Additional peripheral vision is given because of the helmet’s extra wide eye port. Allowing a more panoramic view of the world around you which is important and means that safety is never compromised. The qwest helmet has great padding offering optimal comfort. The paddings are removable and you can put them in the wash, this is something that I am a huge fan of as I hate smelly bacterial helmets! These paddings in the helmet fit very well. The Qwest Helmet has an improved aerodynamically shape and reducing the lift and drag, by utilizing air spoiler. Along with less weight pressure on the neck when you are riding your bike at fast speeds. Every single one of the Shoei Helmets are taking through a through testing in their wind tunnel laboratory. So that a suitable helmet design can be made that can tolerate severe riding conditions in the real world. An aerodynamic shaped shell design matrix. It has an upper air inwards ventilation. This is in a position for maximizing the volume of air volume that will flow inside the helmet. There are fiber materials of high performance that are combined with elastic fibers. Allowing the creation of a shell that is extremely light. Cheek pads made of foam and multi-layered. The helmet has a coating that is scratch resistant. So to conclude, this full faced helmet excels itself with safety, being comfortable, and a good fitting. Not all the health and safety in the world will work with a helmet unless it fits well. 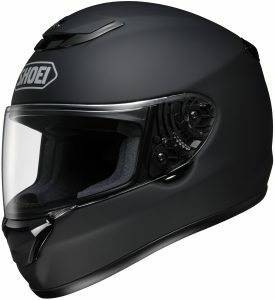 Overall this motorcycle helmet offers excellent value and is highly recommended.